The Children's Room: Chickens to the Rescue! Looking for a fun picture book? Chickens to the rescue! (Actually, that's the title of a book by John Himmelman.) Books about and/or starring chickens are very amusing. For example, Tillie Lays an Egg by Terry Golson (that's Tillie and Terry in the picture) provides lots of laughs and hours of entertainment. You can visit Tillie and her "girlfriends" at the hencam at www.hencam.com/index.php . Who You Callin' Chicken? 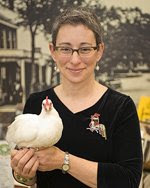 by Thea Feldman explores the crazy variety of chicken breeds. Truly amazing! Don't forget about the DVD Chicken Run--pure egg-stasy!